Jaundice is a common condition which can cause new parents a lot of stress and worry. There are several forms of jaundice and medical expertise is required to differentiate between them. The most common – physiological jaundice – affects around 60% of full-term births and over 80% of premature babies. Because jaundice usually happens in the first seven days after birth. It’s an experience that compounds post-birth tiredness, rollercoaster hormones and the adjustment to bringing your new baby home. New babies produce extra bilirubin. A by-product of red blood cells being broken down. Because their small livers may not be able to remove it, they may become yellow in colour and if bilirubin levels become exceptionally high. There can be complications such as deafness, cerebral palsy and brain damage. When should we worry about jaundice? Our maternity nurse team point out that jaundice has become more of a worry. Simply because many more mothers deliver at home or return home very soon after birth. When mum and baby stayed in hospital for the first week of life. Most newborn jaundice was handled by medical teams without much comment. Today, new parents often find themselves having to asses and monitor it and quite naturally, it’s a strain. A doctor or other health professional should always been contact when signs of jaundice are detected. This precaution often leads to no more than a suggestion to keep an eye on things. Which can trouble new parents but the vast majority of it goes away naturally within a few days. This is one of the times that an experienced maternity nurse can be a real blessing. Having seen many cases of newborn jaundice she will be able to reassure parents about their baby’s progress. Can I estimate my baby’s risk of jaundice? Probably not, but there are some circumstances that make it more likely. For example if you have. A baby born in winter. A baby whose blood type is different to your own. A baby with feeding difficulties. Other children who had jaundice. Your baby is more likely to experience neonatal jaundice. Interestingly, as one of our maternity nurses pointed out, there can be variations. She’s spent many years working with expatriate families in Hong Kong and the aetiology of newborn jaundice in the Chinese population is rather different. Have a higher incidence of neonatal jaundice than other newborns. How is serious newborn jaundice treated? Around 5% of babies will need phototherapy. A technique which turns bilirubin into harmless components that can be passed out of the body. Most commonly babies are taken to hospital and put into incubators with blue lights that reduce their bilirubin levels. 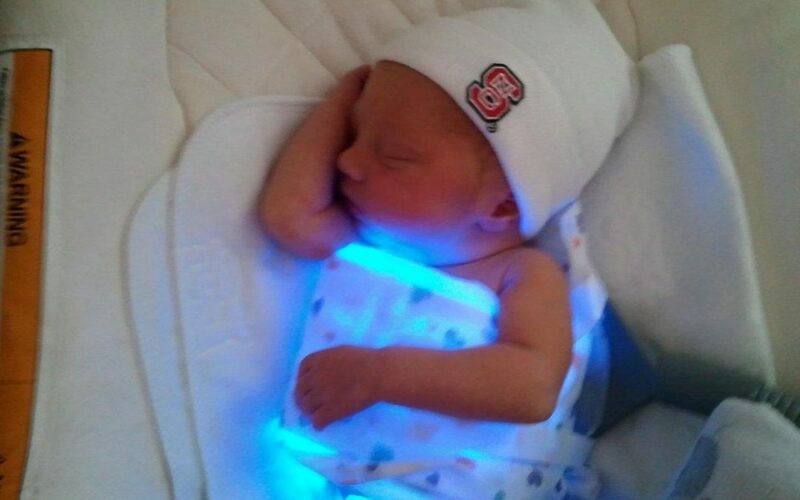 Sometimes parents will be give a blanket lined with fibre-optic cabling that shines a blue light on the skin. Today we know that jaundice is commonplace and it needn’t be a problem. Parents may be encouraged to care for their jaundiced newborn at home or asked to take her to hospital. Either way the treatment is non-invasive and highly effective. Whether you face jaundice or not, you can rest assured that the people supporting have everything your baby needs to move through this phase easily and completely.